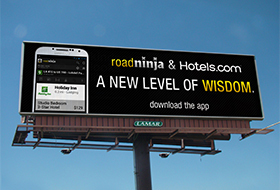 Billboard advertising can be an effective addition to your marketing strategy. Have you ever glanced at a billboard on your way to work or on a long car ride and wondered how effective these large, outdoor advertising displays really are? If so, you’re not alone. Many business owners or managers wonder about the effectiveness of billboard advertising and whether it can produce a return on investment. Because your advertising dollar is important to your business, you need to know how your customers are affected by billboard marketing. According to the Arbitron National In-Car Study, 2009 edition, the average American spends nearly 20 hours per week in a car – either as the driver or as a passenger. Some Americans – especially those with longer commutes – spend a greater percentage of their waking hours in a car than they do watching television, reading magazines or listening to the radio, which are all vehicles that provide advertising opportunities. Taking advantage of those hours that your customers are behind the wheel can be a good idea if you have a clever and strategic advertisement in mind. 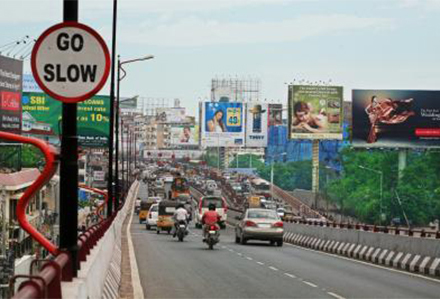 According to the Arbitron study, billboard advertising is effective. According to the study, which reported that 71 percent of Americans “often look at the messages on roadside billboards,” a majority of Americans at one time or another learned about an event that interested them or a restaurant they later patronized. Additionally, 56 percent of Americans reported later talking about a funny billboard they saw while on the road. A smaller percentage tuned into a TV or radio show because of a billboard ad or noted a phone number or web address displayed on one. Of course, getting a billboard noticed is only half the battle. You also want to make sure your customers take action after they view your ad – preferably make a purchase or patronize your business. Since 72 percent of billboard viewers actually shop on their way home and 68 percent make shopping decisions while in the car, billboard advertising can help you snag impulsive drivers. The Arbitron study reported that 32 percent of drivers visited a business they saw advertised on a billboard sometime during the week. Half of the respondents claimed that they had gotten directions to a specific business from their billboard ad. While these statistics may reassure you that billboard advertising can be effective, you still have the task of creating strategic, engaging and clever billboard ads that really get noticed. Since drivers are already engaged, you need an ad that they’ll remember once they’re out of the car. Advertisements that have too much going on – like multiple pictures, lots of text and different colors and fonts – can be too overwhelming for drivers to read as they pass by. Instead, opt for simple and clever ads that draw immediate attention. Be sure that your business is clearly and prominently displayed, so that viewers will associate the ad to your brand. Kristen Radford began writing in 2005 for her campus newspaper. She has served as a feature writer for the life-and-style section of the "Daily Herald," a contributor to "Utah Valley Weekly," an editor for a small publishing house and now as director of communications for an Internet company. Radford has a Bachelor of Arts in journalism from Brigham Young University. The original article appeared on the Houston Chronicle's website. 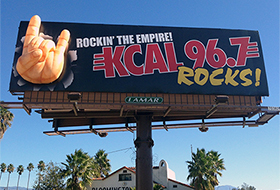 The Redlands-based radio station KCAL-FM (96.7) is the winner of Lamar Advertising Company's billboard competition that asked clients to come up with a winning billboard design that incorporated inflatables.